We are aware about the first landing of astronauts in Moon and other missions of Moon. 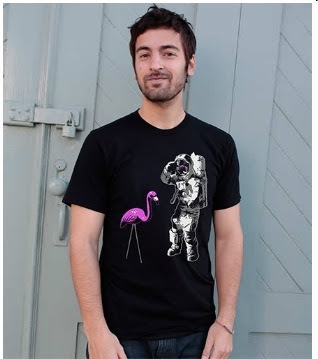 The guys at Headline Shits in San Francisco have come up with "Moon Flamingo Tee" for both men and women and are offering a one-day sale. If you are an astronomy lover then don't miss the sale on Wednesday July 20th,2011 to garb your favorite Moon Flamingo Tee. Shipping is fast as the Tee is shipped in 24 hours from San Francisco, CA and has free returns and exchanges. I like to most to wear this type garments, which is enthusiast me to get interest towards space research, thanks a lot for sharing to us. I really like the idea. The tee is really looking pretty coo.thanks a lot for sharing.